NBA Today: Is Magic for Real? 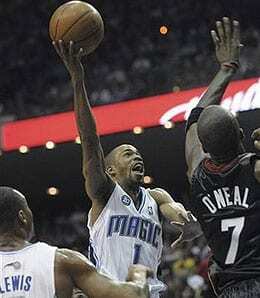 Adding Rafer Alston at the trade deadline was huge for the Magic. The Orlando Magic is having a fantastic season, building on last year’s success and riding an improved defense towards what could be a 60-win campaign. However, it’s reasonable to wonder if Orlando is hitting a wall, after losing six of 14 games in February, a record that might have been .500 for the month had it not been for a great comeback against the Sixers Saturday night. The Magic is firmly entrenched in first place in the Southeast Division, and isn’t really being challenged for third overall in the Eastern Conference, but with Cleveland not slowing down, Orlando is slipping a bit further away from the Cavs and is not gaining on Boston, either. Is this a legitimate contender? The talent is definitely there, but is this team tough enough to go deep in the playoffs? That’s the big question facing the Magic as the season winds down. Adding Rafer Alston at the deadline was a stroke of genius, plugging a big hole left by the injured Jameer Nelson. Hedo Turkoglu is starting to play more like the man who was the NBA’s Most Improved Player last season as opposed to the inconsistent, often poor-shooting performer he’s been most of the season. Orlando lost Mickael Pietrus to another injury, but Courtney Lee has stepped in admirably and, with his recent performance, is providing the Magic with the most consistent play it’s gotten out of the two-guard spot all season. Best of all, Orlando comes home for a pair of games this week in the hopes that it can start to string some wins together after a middling few weeks. If it hopes to successfully chase down Cleveland or Boston, the Magic can’t afford any more letdowns this season. While the Magic offense isn’t quite as good as it was last season, when it was the top-scoring team in the East, it’s not exactly chopped liver this year, remaining among the best in the association. Rashard Lewis was a big part of that attack earlier this season. In fact, he was on a serious tear the last time we checked in on him, but his touches have been down the past couple of months, and February was a real bust, as his shooting went into the tank. Less shots + less makes = unhappy fantasy owners. On the plus side, Lewis snapped a slump and ended the month on a high Saturday, leading the way with 8-for-12 shooting from the floor and 2-for-2 from the line for 23 points. Orlando, one of the most prolific 3-point shooting teams in the NBA, was filling it up Saturday with 15 treys, and Lewis led the way, canning five of them (on eight tries) and pitching in with three assists as well. And with shootout inducing Phoenix coming to town Tuesday, Lewis has a chance to put together back-to-back solid efforts for his owners for the first time since January. Lewis still isn’t getting any more touches than he did last season, and when he is getting the looks, the fact that his shot has been in decline for three years running is a concern. He remains an amazing source of 3-pointers – give him at least one in 52 straight games – but I could see him slipping into the fourth round in next year’s drafts. Like I said, the Magic likes to employ the deep ball. In fact, Orlando tied a franchise mark last night when it heaved up 37 shots from beyond the arc Saturday. Holy long distance attack, Batman. Lee wasn’t exactly red hot, but he led the parade with 12 attempts among his team-high 18 shots for the game. That’s the most touches the rook has ever had in a game – a fantastic sign for his owners. By the way, you can count me among his newest owners, as I got fed up waiting for Rudy Fernandez to earn more PT in Portland, dumping the Spaniard for a different freshman. So far, I’m pretty stoked about the results. Saturday’s win over Philly was huge. Coming off a disheartening home loss to a severely struggling Detroit team on Friday, there was definitely reason to begin questioning whether Orlando was a contender or pretender. But coming back from 11 points down in the fourth quarter in Philly against a Sixers team that plays pretty well at home will help shut up the critics. The Magic dominated the fourth quarter, outscoring Philadelphia 36-20, with Lee draining 13 points himself, the most he’s ever scored in a single stanza. Orlando is now 21-9 on the road, third best in the NBA, and that’s got to scare the crap out of any potential playoff opponent because stealing wins on the road during the postseason is what makes a champion. So as long as the Magic maintain its no fear policy on the road, it will be handful for anyone. If the season ended today, Orlando would meet the 76ers in the first round — a match up that the Magic would probably be chomping at the bit over. Orlando has now won four straight and eight of its past nine games over Philly. By taking all three games against the Sixers this year, Orlando has swept them for the first time since 1997-98. That Magic squad was a .500 team led by Penny Hardaway, by the way. The thing about the Magic is it really lives and dies by the 3-ball. It had made just 10-of-30 through three quarters, well below its season average of 39 per cent. So you’d think Orlando would scale back on the perimeter game in the fourth quarter, right? Uh, maybe not. The Magic attempted another seven treys in the final quarter, hitting five of them to change the complexion of the game. Like any jump shooting team, Orlando is prone to slumps, but full marks for plowing through on Saturday.